This is the latest in a series of posts about the relationship between the Bible, the idea of canonicity and film. The start of the sound era was a time of great development and innovation, but it saw a severe drop off in the production of Bible films. 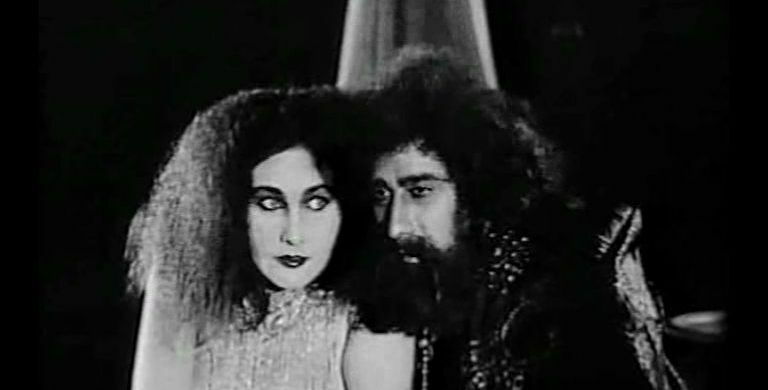 The early silent era had seen around six and a half Hebrew Bible films being made a year - albeit mainly short films. This dropped in the second half of the silent era to around four and a half films per year. But between 1930 and 1948 this dropped to just one. In the entire period only nineteen films based on the Old Testament (and around six films based on the Gospels) were made and none of these were major releases by the main studios. It can be argued, of course, that the cut off point chosen for the end of this era skews the data somewhat. After all this period is artificially constructed and the end point was chosen as the year before DeMille's big studio mega hit Samson and Delilah (1949). But something about the release of that film feels so different from the films made in this period, and from that point on, the rate of production of Bible films picked up significantly. Why might this large drop off in production occurred. Well firstly the financial circumstances during this period were very challenging. The film industry in Europe had not really covered from the First World War. The start of the thirties witnessed the Great Depression in America and similar economic troubles in much of Europe, and then came the Second World War with all its problems. Film production went down across the board, but large-scale, spectacular films like adaptions of the Bible tended to be were doubly problematic. The other restriction that really choked the flow of films based on the Bible in this era was America's production code and similar types of censorship in other countries. Amongst the restrictions were bans on showing the face of Jesus - little wonder then that the majority of Jesus films made during this era came from Mexico. It is also possible that the climate at the time was such that depicting other major biblical figures was also frowned upon. A quick look at the titles made during this era is also instructive - even the films that were made were far from mainstream. There were, of course, a few remakes [Joseph and His Brethren (1930), Joseph in the land of Egypt (1932), Samson (1936)] a few of the old favourite stories sneaking through [Queen Esther (1948), Potiphar's Wife (1930)] but the other films are markedly different from what we tend to think of as Bible films today. Not dissimilar in this respect is The Green Pastures (1936) which rather than attempting to depict the various events as they may have occurred portrays them as imagined by children. The film is perhaps the most well known Old Testament film of the era so it's interesting that it takes an alternative approach to canonicity, often with an emphasis on oral transmission rather than text. 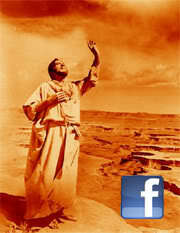 In particular is the episode featuring an unspecified prophet. The prophet is a composite of various characters from the Bible. His existence as a type deemed more importance than his particular character and correspondence with a particular person. More interestingly, given that these are events reconstructed from children's minds, is the possibility that the prophet's name is unknown because the child/children in question do not have the same degree of familiarity with the later parts of the Old Testament canon than they are with the earlier parts. Incidentally whilst composing this post I've heard word that the 1948 Queen Esther film is due to be released on DVD in the run up to this Christmas by the Cathedral Films Preservation Project. More on that in due course. Carl Theodor Dreyer is rightly revered as a filmmaker of some repute, whose bold and uncompromising films, such as Ordet (1954) and La Passion de Jeanne d'Arc (1928) offer and austere, yet beautiful, exploration of human passions kept in check. Sadly there's only a little evidence of the Dreyer's impressive future in Blad Af Satans Bog [Leaves from Satan's Book] (1921) an unexciting rip off of Intolerance (Griffith, 1916). Four stories from different historical periods illustrate an oddly complicated punishment regime that the Lord has meted out on Satan where he must tempt humanity even though it pushes him further and further from grace. Whilst it's the first period - set just prior to Jesus' death - that is of most interest here, surprisingly it's the obscure love story from the margins of the First World War that proves to be the decisive moment in the relationship between God, Satan and humanity. Perhaps Dreyer would come to rue his optimism here that in the Great War humanity had reached its lowest point and was, at last, beginning an upward trajectory. Certainly Dreyer wished to revisit his handling of the Jesus material. Much has been written of Dreyer's attempts in later years to make a film called Jesus of Nazareth that would cast a Jewish actor as the Son of Man and presumably attempt to undo some of the more worrisome anti-Semitic aspects of his original adaption of the Gospels. Common to all four stories is Satan taking on human form and seeking to influence those around him to betray their souls. Yet whilst Satan has some success influencing the persecution of an inquisition-era Spanish astrologer and the execution of Marie Antoinette it's in the first section where is able to not only trick Judas, but also to persuade Caiaphas to incite a riot. As with so many Jesus films of this era the Jewish people are portrayed as wizened and grasping in contrast to the noble-looking Romans. That said, one of the film's most surprising turns is that the episode truncates before Jesus ever encounters Pilate, shortly after Jesus is arrested in Gethsemane. Indeed only three episodes from the gospels feature - the anointing at the house of Simon the Leper, the Last Supper and the Garden of Gethsemane. The focus here is far more on Judas and his emotions than on his master. 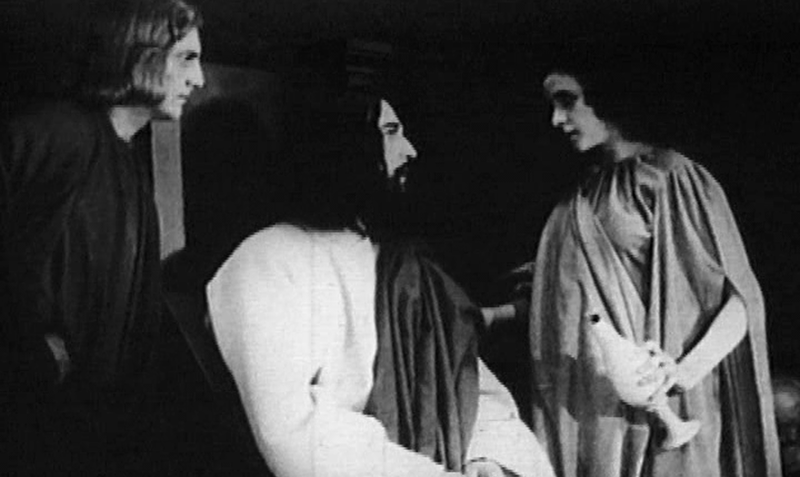 The film opens with Jesus being anointed and Judas is clearly disappointed with the path Jesus is taking. Satan appears and sympathises with his disillusionment eventually lulling Judas into his trap and leaving him at the moment his remorse begins to hit home (though notably before he takes his own life). The footage of Jesus, however, is more distant and remote. Jesus is often shot from low down and close to the top of the frame. He is constantly peering upwards as if through his brow. The scene of the Last Supper is visually striking, but also rather stiff and unimaginative. If by the end of the section Judas is disappointed with the course events have taken is hard to understand what it was that compelled him to follow Jesus in the first place. In making his Jesus story the only episode of the four that doesn't revolve around a traditional love story Dreyer also imitates Intolerance, but in contrast to Griffith, Dreyer does actually develop his Judean story and offer a subtler, more nuanced portrait of events. There are some notable touches of his future work here as well, not least the number of and prolonged use of close-ups. In particular the close ups of the woman anointing of Jesus, hints at Dreyer's use of extreme and lengthy close-ups of the face of Maria Falconetti in La Passion de Jeanne d'Arc. That the later film was just seven years away is surprising - in terms of the development of Dreyer's style it somehow seems far longer. The latter part of the silent era saw a distinct change from cinema's early days . Perhaps the most significant change was that films gradually moved from short films - originally less than a minute - to epics of three hours long. By the end of the silent era very few films, relatively speaking, were being made that were less than feature length and the available resources were concentrated on a lower number of longer films, the era became more professional and standardised. Bible films in this era were no different. The rate of production of films based on the Hebrew Bible, for example dropped from around 6.5 per year prior to the release of Intolerance to 4.5 per year thereafter. There was also a little less diversity. 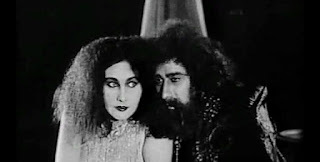 Many of the characters that appeared in the early silent era did not reappear in the latter period - the stories of Athalia, Jael, Ruth, Elisha, Micah, Joshua and Daniel were just some of those that were not remade and overall the range of stories dropped by about a quarter. At the same time new episodes did get their first airings. In 1918 the German film Hiob became the first film to tell the story of Job. 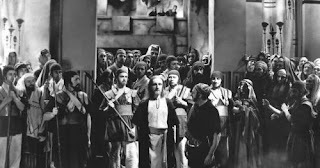 Four years later another German film, Jeremias (1922) broke new ground with the first film about Jeremiah whilst neighbouring Austria saw the creation of Sodom und Gomorrha, directed by Mikhaly Kertesz. Shortly afterwards Kertesz escaped to Hollywood, changed his name to Michael Curtiz and went on to direct some of classic-era Hollywood's most famous films such as The Adventures of Robin Hood (1938) and Casablanca (1942). One of his first films in America however would be the last "silent" Bible film of note, Noah's Ark (1928) which he directed for Warner. The majority of the film was shot as a silent movie, only for a few extra talking scenes to be added as producers rushed to keep up with the latest technological development. 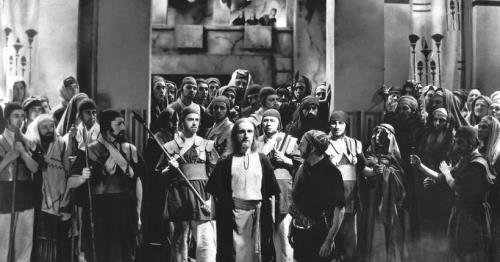 The other significant change in terms of production was that whereas the early silent era was typified by a handful of directors such as J. Stuart Blackton, Louis Feuillade and Henri Andréani each of whom made a series of Bible films, here most directors only made one film based on scripture. There are obvious exceptions to this like DeMillie and Curtiz/Kertesz who both made a pair of biblical films (DeMille's The Ten Commandments (1923) and The King of Kings (1927); Curtiz/Kertesz' Sodom und Gomorrha (1922) and Noah's Ark (1929)), but the era of a few dedicated directors continually ploughing the same furrow was over. But other changes were also afoot, firstly character development began to improve. The earliest silents had just presented actors as little more than cinematic nativity figurines, but even by the 1910s even the minor characters were beginning to get developed, 1910's L'Exode, for example, invented and developed the Miller and his family to heartbreaking effect. Intolerance really showcased film's ability to develop a series of characters and get audiences to identify with them even when there were many characters across several stories. This tendency quickly followed in films from the Hebrew Bible and began to gain traction in Jesus movies as well such as Robert Wiene's 1923 I.N.R.I. (Crown of Thorns) where the characters of Judas and Magdalene are also developed. This tendency to develop the more fringe characters seems to have lent itself to other films developing the same characters and as a result the scenes in which they were prominent began to embed themselves in the canon. For example, even though the gospels never associate Mary Magdalene with the woman caught in adultery from John 8, conflating the two became a common way to boost Magdalene's involvement with the result that this story has a strong position within the New Testament canon. There's one more thing that is significant about this era that I've not yet touched on and that is the emergence of the big stories that would embed themselves as a key part of the filmic canon from this point onwards. My comments above touch on the breadth of films that were made during this period, but the height of the different films is also significant. It was, after all, in this era that we began to see the emergence of the big Bible film - those films that involved a significant investment and provided the necessary spectacle that would come to be synonymous with the genre. There are two points to note here. Firstly, that all of these films would get a big screen Hollywood remake of sorts in the period between 1949 and 1969. In four cases they used the exact title. The most tenuous claim here is the story of Noah which formed a/the key component of Huston's The Bible (1966). The point could also be made that five of the six stories have also received relatively recent big screen Hollywood adaptations, albeit with a divergence of styles (The Prince of Egypt and Year One for example). The other point is the flipside of this, that what might be thought of as important stories which didn't get a major adaption during this era (e.g. Adam and Eve, Abraham, Joseph, Joshua, Gideon, Daniel, Judith) tended to be those that have lacked a subsequent big screen Hollywood adaption. There's a certain amount of cherry picking here - Solomon was covered in 1959, Esther in 1960 and Adam and Eve/Abraham were also part of Huston's The Bible, but generally the trend holds out. All of which raises the question of why this was. Was it that knowing these films had been successful in the past allowed producers a certain comfort that these were the stories that would do well? Was it that there was a sense of nostalgia that even the filmmakers felt themselves or, at least, felt their audiences would feel? Or was it that these were the stories most suited to the big screen where the elements of size and spectacle and/or miracle are the most apt to be captured in the big "Hollywood" blockbuster? In 1955 would-be makers of epic films faced a dilemma. On the one hand biblical films had suddenly become popular and the studios, desperate to cash in, were trying to make all they could out of the new trend. The new, wider, screens called for more eye-catching images and post-war, the public was ready to move on from film noir's cheap sets and low budgets. Yet on the other hand, the depiction of Jesus, the Bible's biggest "star", was very much frowned upon. You could show one or two of his limbs (as The Robe and Salome had done two years previously) or have him speak through a boy and a blinding light (as in 1951's Quo Vadis? ), but such approaches were rapidly running out of road. MGM's solution to this dilemma was that instead of trying to tell a story around the margins of Jesus' life, was to focus instead on a story that Jesus told - the Parable of the Prodigal Son. Jesus was, after all, famed as a story teller and this would enable MGM to appeal to the market for biblical stories without even needing to show Jesus himself. It wasn't the first time the parable had been adapted for the silver screen. Silent portrayals of the story went as far back as Ferdinand Zecca's 1902 version for Pathé and four more adaptations would follow in the next ten years. The parable's short, punchy style was ideally suited to the shorter running times and the imagery of money being wasted on parties and of a loving father running down the road to embrace a wayward son worked well for an art form that was still finding its feet with dialogue. Without the possibility of Jesus as a leading man, MGM opted to boost the movie's star power by giving the headline role to its own star, Lana Turner. The move was not without precedent. Two years earlier Columbia had used another star of film noir, Rita Hayworth, to front Salome; similarly taking advantage of the way the genre/change of cultural context enabled them to display their leading ladies in more revealing costumes without the characters losing respectability. However, whereas Hayworth was backed up by Charles Laughton and Stewart Granger, Turner was cast opposite Louis Calhern and the relatively unknown Edmund Purdom. Furthermore, as the prodigal son of the title, it was Purdom who had the greater screen time and around whom the story was based. Purdom plays Micah, a Jewish son living in Joppa, who, in the very first scene, clashes with a prominent member of Damascus's pagan religious hierarchy by liberating one of his slaves (James Mitchell's Asham). Returning to Joppa shortly afterwards he instantly falls for Astarte's high priestess, Samarra (Turner). Micah returns home determined to "have" Samarra for himself and persuades his reluctant father to give him a quarter of his wealth. Whilst this first part of the story drops in a couple of references from the Bible ("For the lips of a strange woman drop as an honeycomb...her feet go down to death" Prov 5:3 and, rather more crassly, "I'm hungry enough to devour a whole fatted calf") it also makes critical changes to the story. Micah's rescue of Asham, for example, establishes his exceptional, high sense of morality if also illustrating his carefree attitude to money. Micah is unlikely to prove his respectful enough to make his father ashamed of him. True enough whilst his father is unhappy initially, he quickly accepts his son's decision and reassures him that he'll love him "no matter what". Nevertheless the loss of much of Micah's part of the fortune is due to him being exploited by one of the money lenders from Damascus, the high priest of Baal (Louise Calhern) and perhaps even his new found love. The effect of all this is does rather cheapen the grace which is the heart and soul of the original story. The son is transformed from one seemingly beyond redemption in the original parable, to someone who is basically a good, if naïaut;ve, person who simply happens to hold some different opinions to his father. It's hard to find anything here that would cause a significant rift between father and son, and indeed there isn't. From there on things take a turn towards what some see as the ridiculous and others as untrammelled entertainment. It gradually become apparent that Micah is the stereotypical, slightly spoilt, rich, boy; arrogant yet unaware of how he's upsetting people, and clearly having more money than sense. If his behaviour in the opening scene quickly gets his audience on side, such support dissipates scene by scene as the movie progresses, not helped by Purdom's lack of warmth, charisma or chemistry with Turner. Incensed by how he has been treated Micah begins to lead a rebellion, but its beset by the kind of problems which increasingly feel like the kind of thing that only a rather desperate screenwriter could come up with. So in relatively short succession we get a sacrificial victim willingly diving into a fire pit, a series of people throwing knives which somehow stick awkwardly into their victim's necks, Micah's mute slave being magically restored to life, an play performed by characters wearing bizarre animal headed costumes and a man wrestling with an actual vulture. The last of those moments certainly deserves to be more famous and not as the surprising missing link between DeMille's Samson and Delilah (1949) and Hitchcock's The Birds (1963). I struggle to think of more than one or two films where someone tussles with an avian opponent, let alone where he had to choke a full-sized feathered assassin to death using a recently discarded bone. Director Richard Thorpe had been fired by both Esther Williams and the producers of The Wizard of Oz for being unimaginative. One can only imagine that, stung by the criticism, he determined never to guilty of that particular cinematic crime again. By the man-vs.-bird's standards, the finale seems rather tame, though it's undoubtedly over the top in its own way. Micah decides to overthrow the leaders of the religions of Baal and Astarte and musters a group of Damascene rebels to help him in his task. They storm Samarra's temple, and throw rocks at her until she dives headlong into the sacrificial fire pit. Were it not for its over-the-topness it might have been a more shocking moment. Fifties epics had their fill of stories where a Judeo-Christian women meets, and eventually converts, a pagan man (usually Roman) to her faith. Here the roles are reversed and yet whilst Micah manages to get Samarra to compromise her own faith enough to sleep with him, it is not enough to convert to his Judaism. Why did the filmmakers decide not to give Samarra the redemption the rest of the film points towards? Is it just that Micah's own compromised faith is not strong enough to transform her belief? Or might it be that because his faith was Jewish (i.e. not fully Christian) that they decided it was not powerful enough to convert her? Maybe it was that as a sexually impure women they judged her beyond redemption despite the (presumably) sexually experienced male leads of Quo Vadis? and The Robe being reached by the sexual purity of the women they loved? Whatever their reason it rather mutes Micah's overthrow of the oppressive Baalan/Astartean regime and sees him return to his father with his tail between his legs despite what would be, in other biblical epics, a significant victory. In some ways this is probably just as well - after all, had Micah ridden home triumphant on the back of the grateful Damascans the "father I have sinned against you and against God" speech might have sounded a little hollow. Yet ultimately the film has two endings, neither of which is really particularly satisfactory: the victory in Damascus is shorn of the triumph over adversity that seeing Samarra rescued (and on the film's terms, converted) would have provided; the shocking forgiveness and redemption of the biblical ending is stunted by the lack of a truly wayward son. Ultimately his father's unconditional acceptance ends up being merely more or less normal behaviour rather than an outrageous and unexpected act of forgiveness by an ever-loving father. Growing up in a church home I knew about the prodigal years before I knew what being prodigal actually was. Even today its rare to hear the word in a context unrelated to Jesus' story. And it's hard to escape the feeling that a director like DeMille might have made rather more entertaining and satisfying film out of his lead's infamous prodigality and subsequent repentance than Thorpe does here. Perhaps The Prodigal's biggest failure is that it took the "Son" out of the film's title, but the "Prodigal" out of the actual movie. I'm pleased to announce that I'm going to be partaking in the Sword and Sandal Blogathon which is taking place from the 8th-10th July 2016. I decided to join in quite a while ago and have been looking forward to taking part in something bigger than my own little corner of the interweb, but I only decided this week what I was going to cover. My decision, ultimatelyl, is to review The Prodigal (1955) a Lana Turner vehicle essentially expanding the Parable of the Prodigal Son into a movie length feature. Keep an eye out over the next few days for my review. Also if this sounds like the thing you'd be interested in joining in with then it's not too late (and I think it's very much one of those the-more-the-merrier type affairs). Simply choose your movie and add a comment to Debra Vega's original post announcing the blog-a-thon and then post your relevant review up over the next few days. Many thanks to Debra for hosting this. I'm looking forward to seeing the various reviews. Thanhouser's The Star of Bethlehem (dir. Lawrence Marston, 1912) originally ran to three reels, but only around one reel's worth of footage (~1000ft) has survived. Thankfully this is one of the many silent films that the present day Thanhouser has made available to view for free on Vimeo. In some ways it's a shame that much of this footage has been lost. Marston and scenario writer took the unusual approach of prefacing the film with material from the Hebrew Bible including footage of Isaiah and Micah. Whilst The Living Bible Series and Rossellini's Il Messia also take a similar approach this is the only time that Micah has ever been depicted on screen as far as I am aware. 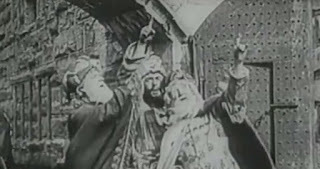 The remaining footage begins in the court of King Herod in the middle of "revelry" (to quote the intertitle card) with the three wise men about to arrive. The opening shot allows the time to soak up the atmosphere of Herod's court before the we move outside where the magi arrive and mange to persuade the guards to grant them an audience with the king. The film's two nicest shots feature here as the wise men walk past a company of guardsmen in one shot and then emerge through the crowd in Herod's court room in the next. In both shots they enter from the back of the shot and work their way towards the front; in the first progressing along the right third of the screen in contrast to the static guards in the leftmost two thirds; in the second entering from deep centre whereby the crowd parts to let them through. Whilst the camera here is static, the depth of focus and composition of these shots is a little ahead of its time particularly in the way that the balance of the composition of the shots only fully works as the image is moving. Having been permitted by Herod to seek the child and instructed by him to report back the three head off in pursuit of the star managing to bump into the shepherds just as the angel of the Lord appears. Rather touchingly the mixed group of shepherds and magi team up and head off towards the stable together. It's an unusual move but given the apparent difference in wealth between the two groups the way these barriers are never even an issue rather emphasises the fact that all are equal before God. The inside of the stable is tightly composed with a rather ethereal-looking Joseph at the front of the shot. Whilst almost all film Josephs and Jesuses are usually dark-haired, bearded thirty something men, there's a certain something about this Joseph that makes him appear unusually Jesus-like. The climax of this shot (and, indeed of this remaining fragment) sees the group hold their pose in adoration whilst a group of super-imposed angels appear at the top of the shot. I don't know where the original film ended, but this seems as perfect an end point as I can imagine, particularly for a film that was originally released on Christmas Eve. 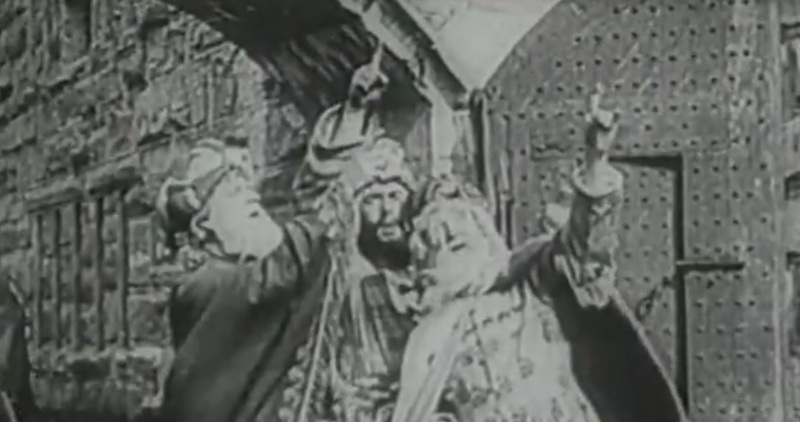 The Star of Bethlehem: One reel, released December 24, 1912. Biblical tale about the birth of Christ told with a cast of 100's, one reel British version edited from original three reel release. Print source: British Film Institute National Film and Television Archive, 15 minutes, 13 seconds. Cast: Florence LaBadie (Mary), James Cruze (Micah, Joseph), William Russell (Herod), Harry Benham (Angel Gabriel), Justus D. Barnes (Gaspar, one of the Magi), Charles Horan (Melchior, one of the Magi), Riley Chamberlin (Balthasar, one of the Magi), Harry Marks (scribe), N. S. Woods (scribe), Lawrence Merton (scribe), David H. Thompson (Pharisee, rabbi), Lew Woods (Pharisee, scribe), Joseph Graybill (Roman messenger), Carl LeViness (shepherd), Frank Grimmer (shepherd), Ethyle Cooke; total cast of 200 persons. 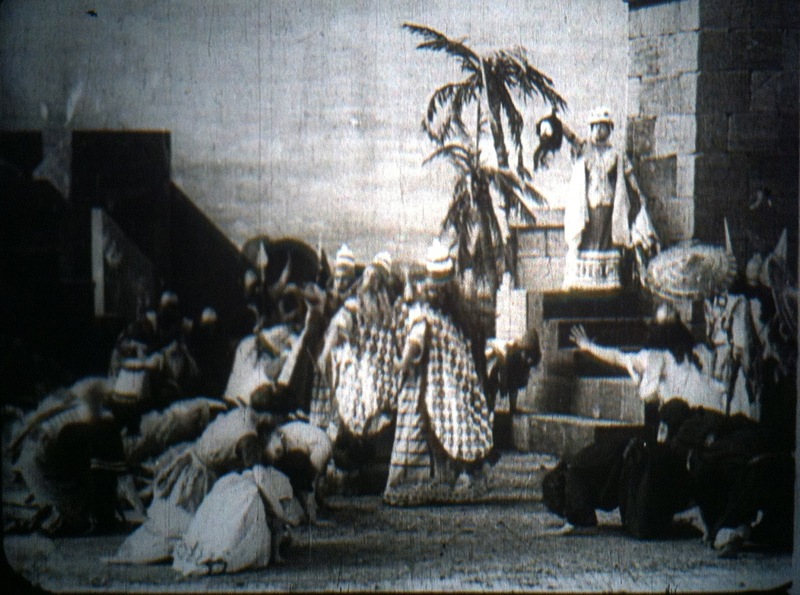 Thanhouser's ambitious Star of Bethlehem was one of the first steps toward true feature-length films (more than two reels long). It appeared the year before the Italian epic Quo Vadis? was viewed in the U. S., and two years before the first Hollywood feature, The Squaw Man. The original negatives were destroyed in the Thanhouser studio fire just three weeks after its first release. Preparation of this epic was one of the last duties of Edwin Thanhouser before leaving the studio that bore his name. He had sold it to Mutual in April of 1912 and continued to work as studio manager until he "retired" in November, 1912, only to return in 1915. Thanhouser's biggest production up to that point in time, the film required a one-month shooting schedule, employed a cast of 200 (including forty principals), and cost a hefty $8,000. Special effects alone took a full week's work. Thanhouser studio's flair for sumptuous costumes, crowds of actors, and rich staging is evident in this epic. Some of the larger scenes reportedly were filmed with two or even three cameras shooting from different angles. The ratio of two-and-a-half feet of film exposed per foot of film used is modest by today's standards, but was extravagant for 1912. This film is available on DVD from Thanhouser Company Film Preservation, Inc. at thanhouser.org. In the previous two posts in this series I looked at how the cinema of the early silent era treated the Hebrew Bible and the Gospels. I know want to have a look as to some of the reasons as to why this might be. This earliest period of film history was very chaotic, certainly when you compare it to the studio system that dominated in the middle of the twentieth century. Studios were only just being set up and whilst some of the names of those studios remain known to us (such as Pathé and Gaumont), most of the film producers from this era have faded from general consciousness. In many ways this was the wild west (although cinema's move to "the west", to Hollywood, did not begin until the second half of the silent era). The technology was still emerging, and improving at a rapid rate, systems were very much ad hoc, expectations around production values were still fairly low, the star system was still in its infancy and the expectations of what going to see a/some film/s actually entailed was very much still fluid. In essence this still forming context meant that making films was still relatively cheap. Films could be less than twenty minutes, shot against the kind of painted sets as seen at the theatre, and without the need to pay stars huge wages. The shortness of many of the individual films meant that exhibitors commonly showed numerous films in an evening's entertainment, meaning there was a demand for a larger number of films. It also meant that the range of filmmakers was relatively diverse and they brought with them their own agendas and interests. So there were the technological pioneers such as the Lumierè brothers, dramatists from theatre backgrounds, magicians such as Georges Meliés and, of particular relevance here, clergy men and evangelists seeking to harness the potential of the new medium for instruction and to spread the gospel. Perhaps surprisingly, the period that most matches the hive of filmmaking activity at the start of the 20th century is that start of the 21st century. For much of the intervening period filmmaking became the expensive preserve of the rich or the dedicated. But this earliest period and the current one have found a far more democratized marketplace where production of films is relatively cheap, markets more forgiving and distribution channels more fluid. Religious filmmakers, both then and now, have very much taken advantage of this democracy and both periods are marked both by a relatively high number of religious films and considerable diversity. It's perhaps not coincidental, then, that stories which have not considered particularly worthy of adaption in more professional circles, but are perhaps close to the hearts of religious groups have primarily featured in these two periods. The Book of Daniel is perhaps the most notable example here. The result of all the activity in this period meant that the numbers of films made was relatively large and diverse, such that the probability of an obscure story being adapted into a film was relatively high. This pattern is particularly apparent when such stories were aligned to a group's specific interests. Nevertheless one thing that is interesting, not least when viewed from the supposedly enlightened 21st century, is this period's inclusion of episodes that have a more prominent female perspective. So during this period we have the Old Testament narratives of Jael, the Shunamite woman and Athalia; the deuterocanonical stories of Judith and Susanna; and Gospel episodes such as the woman of Samaria, the daughter of Herodias and the almost ever present appearance of Veronica. It's commonly assumed that our own era gives women the greatest voice, but there are persuasive arguments in favour of the earliest silent era. Firstly whilst the impact of directors such as Alice Guy Blaché has historically been minimised by film historians, this is starting to reverse and Guy's contribution in particular has been highlighted for the way it developed cinema. Secondly there are various prominent other roles in filmmaking where there was gender parity, in particular script writing and editing. Finally as cinema was then, as now, primarily a financially motivated business the fact that many of the films of the era seemed those more likely to appeal to a female demographic such as those above with a female hero. There's a further factor however as to why certain stories ended up being adapted whilst others weren't and that is the religious context in which certain stories were chosen and these films were made. 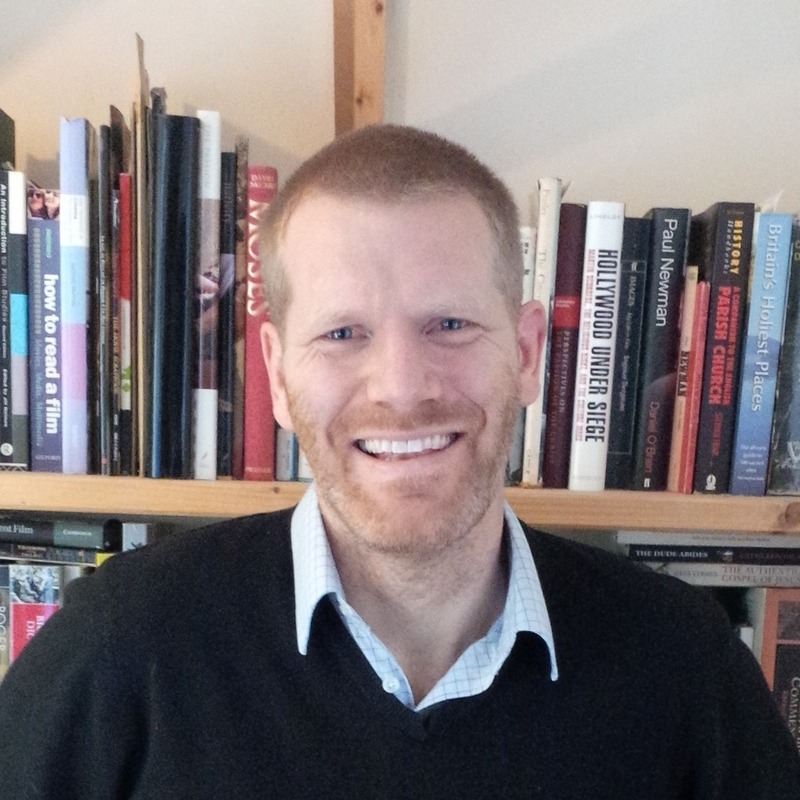 Of course the sheer numbers of people who are part of the Christian faith means that instead of talking about a diverse and wide ranging religious context we are essentially talking about contexts and whilst numerous of Church historians have attempted to summarise and compartmentalise the journey that Christianity has taken, the very fact that these various accounts differ from one another in terms of emphasis and even, at times, perceived fact only further underlines the point. Furthermore it is also questionable to what extent an individual, or rather a group of individuals, will adopt the overarching mindset and approach of the majority of those who share their faith living in the same place and time. 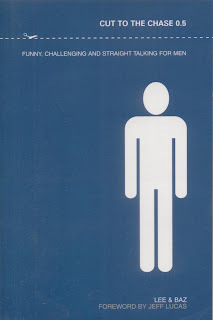 Given this complexity, and that coming up with a path through these dilemmas is outside of the scope of the present work, I shall just offer a few broad observations on these evolving and diverse contexts. The first is to note the shifting locus of filmmaking activity. In the early silent period it was the French film industry that was to the forefront, with Pathé and Gaumont leading the way as well as the work of the Lumières, Guy Blaché and Georges Méliès, though there was also notable activity in Italy, Britain and the US. When it comes to questions of canonicity, then, it's not difficult, then, to understand the adaption trajectory of, say, the deuterocanonical story of Judith. Whilst it's easy to be distracted by the most famous version of the story, D.W. Griffiths' Judith of Bethulia (1914) produced in Protestant America, the remainder of the Judith stories in this era were from Catholic France and Italy. Nor is it surprising, then, that as the European film industry declined during the First World War and took off in America, that this story has largely faded from view. The notable exceptions to this are a brief renaissance in Italy during the "Peplum" revival of their film industry in the 50s and 60s and a flurry of TV films in a number of other Catholic countries in the 70s as TV drama began to gather momentum. This shifting context may also provide part of the reason as to why characters such as Susanna and Veronica also fared well in this era. The interwar period cemented this shift in the film industry from Catholic France to Protestant America. The First World War shattered France and the French film industry, the troubled economies of the rest of Europe struggled to recover and the problems were exacerbated by the exodus of filmmaking talent from Europe to America. Michael Curtiz, for example, made Sodom und Gomorrha (1922) and Die Sklavenkönigin (The Moon of Israel) in 1924 before fleeing Nazism and making Noah's Ark for Warner in 1928. Whilst American film still predominates today, it's noticeable that the growth of the film industry in other regions has led to new regions making films about stories found in the Bible. For example, Catholic Brasil has produced a number of extended series about biblical characters, such Rei Davi (King David, 2012). Elsewhere a number of films have been made in Islamic countries such as Turkey and Iran, though with more emphasis on the Koranic presentation of these stories than the corresponding biblical versions. This again is a different understanding of Canon, one that Christianity does not identify with and yet which very much impinges on the way the canon has been adapted on screen. One final point that is worth noting is the impact of a number of key works related to the Bible that may have had a wide effect. For example, various authors have noted similarities in composition between particular scenes and famous religious paintings. Perhaps the most well-known example is Leonardo's "Last Supper", but other examples abound. However it is difficult to gauge how recognisable these paintings would have been given that they were single works. They are considered hugely influential, and have been widely copied and imitated, but whilst they would be well known by any student of art, many of the early filmmakers were not students of art. Nevertheless it's not hard to imagine that these influential images begat more artistic interpretations of the same story which may have led to certain stories becoming more prominent, yet this is not always the case. One of the most famous religious images of all time is Michelangelo's "The Creation of Adam" yet the Sistine Chapel also contains a considerably larger depiction of Perugino's "Moses Leaving to Egypt" featuring the moment when Moses' son is circumcised after an angel tries to kill Moses (Exodus 4:24-27). This episode has, to the best of my knowledge, never featured in a Moses film despite the proximity of Perugino's image to Michaelangelo's.